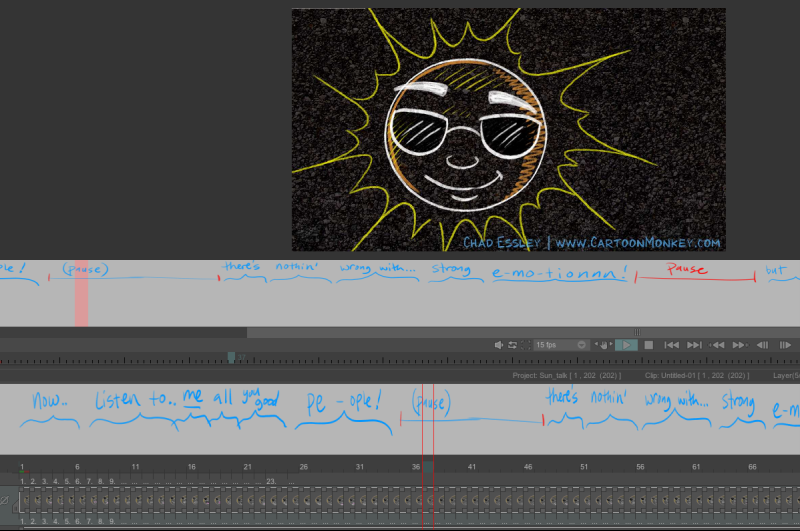 The Timeline Notes was created in order to provide the animator with a way to add graphical annotations and notes to its animation. It is a tool to make its work easier. 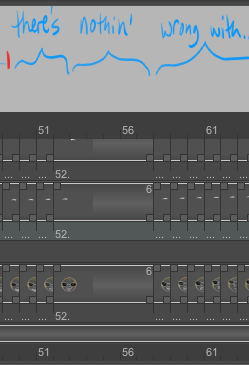 On the screenshot, you can see that the Timeline Notes is divided into two parts, a left and a right one. All the options of the Timeline Notes are available in the left part. The right part is dedicated to the drawing annotations. By default, you can directly draw on the right part with a blue pencil. We can see that there are 3 sub-sections in this part. * Let's start with the second part. It holds the main tools of the Timeline Notes feature. Most of the tools available here look a lot like the tools of the Sketch panel, studied in lesson 5. The three colored circles allow you to change the color with which the annotations will be drawn. The Pencil tool icon allows you to draw annotations with the color of the icon, as if you had a real pencils. The Color Eraser tool allows you to erase only the color that is displayed on the icon. The Tint tool icon allows you to paint any pre-existing annotations into the current color. You can turn any line blue, red or black. This action deletes all the annotations of the current color, and leaves the other colors intact. This action allows you to turn the Timeline Notes into blue, red or black color. All the annotations will be colorized with the current color. Remember that the Undo ([u]) and the Redo ([Shift]+[u]) actions are available in the Timeline Notes. The Eraser tool completely erases the annotations independently of their color. It has the same functionality than the Color Eraser tool ( ) but without taking care of the line color. The Clear All action simply erases all the annotations in the Timeline Notes. The Slice tool allows to split the Timeline Notes into two parts. Select the tool, click on the position you want splitting and drag the right part of the Timeline Notes where you want. The Move tool moves all the Timeline Notes. Just click on the right side and drag it. * Now, let's say a word on the option in the third sub-section. - The Grid slider value enables discreet gray vertical lines on the Timeline Notes. This value represents the number of image between each vertical line. 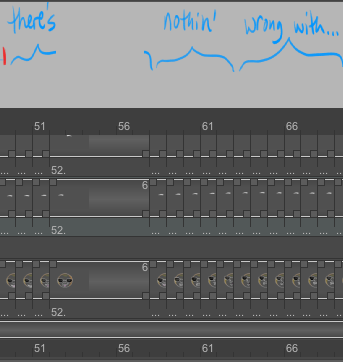 The aim of this option is that the animator can clearly see to what images, his annotations correspond. If the slider value is 0, the vertical lines are disabled. It is the default value. - The Size slider parameter allows to change the size of the different tools which are used. Each tool ( , , and ) stores its own value. - The functionality of the popup is really interesting. It allows you to play all the Timeline Notes over the project when it is played in real time. This option can draw the Timeline Notes at different positions and sizes over the project. Now that all these options have been studied, let's see an example with the elephant project. You will find a little dot on the top right corner, in that part of the timeline. If you click on it, you will lock the timeline for notes, in order to avoid any mistakes or errors.